From all indications, it was obvious many had waited for the day. Friends, old and new colleagues as well as leaders in business and government, all wanted to celebrate a man, who had given his all to the media and Nigeria business environment. In his unique style, Dr. Waheed Olagunju, a former acting managing director of the Bank of Industry, had sent out a classical invitation out few weeks ago, with an inscription; ‘Dr. WAO AT 60’. Perhaps, Olagunju had wanted a quiet birthday soiree, where friends and family members would come and appreciate what God had done for him in six decades. But he got more than he bargained. Since the birthday ceremony coincided with his retirement, the invitation had stated that Olagunju simply wanted friends to join him on Sunday April 7 at a prayer session to express profound appreciation to God for the two milestones. Though this was meant to be followed with a reception, as Olagunju was planning for the party, a few closest friends and professional colleagues in the media, banking and marketing communications industry were also putting heads together to celebrate one of their own in another beautiful manner. This explains why the event that was meant to be a day affair turned out to be two days at two different locations in Victoria Island Lagos. After the solemn prayers with thanksgiving to God for granting him a successful career and for clocking the age 60, the atmosphere changed as various entertainment groups mounted the stage to entertain the birthday boy and his friends and family. Within a short time, men and women, old and young had bombarded the dancing floor to celebrate a top player in the investment and development banking environment, who was bowing out of service. The prayer session was led by Dr. Ismail Musa, the Chief Imam of the University of Lagos. Aside the tributes to Olagunju, which were well captured in a 96-page photo book containing his biography, given to all guests, who attended the reception held at the Harbour Point, Victoria Island, Lagos, some of the guests also used the occasion to speak glowingly about a man who has traversed many industries and excelled in all. Perhaps as a result of President Muhammadu Buhari’s personal disposition to parties, not a few people in the hall took time to digest his goodwill message, signed by Femi Adesina, special adviser to the president on media and publicity. 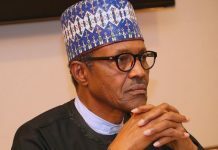 The statement, which stated that the president celebrated with all family members, friends and associates of Olagunju, also commended the celebrant for always making himself available for service to the nation and humanity. This was said to be centrally motivated by his fear of God and sense of patriotism. He also lauded him for playing a significant role in supporting the vision of diversifying the Nigerian economy through innovative and actionable ideas that translated into growth of more small and medium enterprises across the country. The president prayed that, as Olagunju turns 60, the almighty God would grant him long life, good health and strength to continue serving the country. Minister of Industry, Trade and Investment, Okechukwu Enelamah, thanked Olagunju for serving the nation, BoI and for his loyalty when they worked together. Enelamah prayed God to bless the celebrant even more in all his future endeavours. The First Lady, Mrs Aisha Buhari, who was represented at the prayer session and reception by a formidable group of eminent women led by Mrs Mary Paul, also congratulated Olagunju and commended him for supporting the nation’s development programmes. On his part, Managing Director and Chief Executive Officer, BoI, Olukayode Pitan, described Olagunju as a very versatile person, who came from broadcasting, where he was reporting sports, to build a good career in banking. Pitan said: “He (Olagunju) has institutional memory. If there’s anything you wanted to know about BoI – before it was born, how it was growing as a baby, all you need to do was ask him. 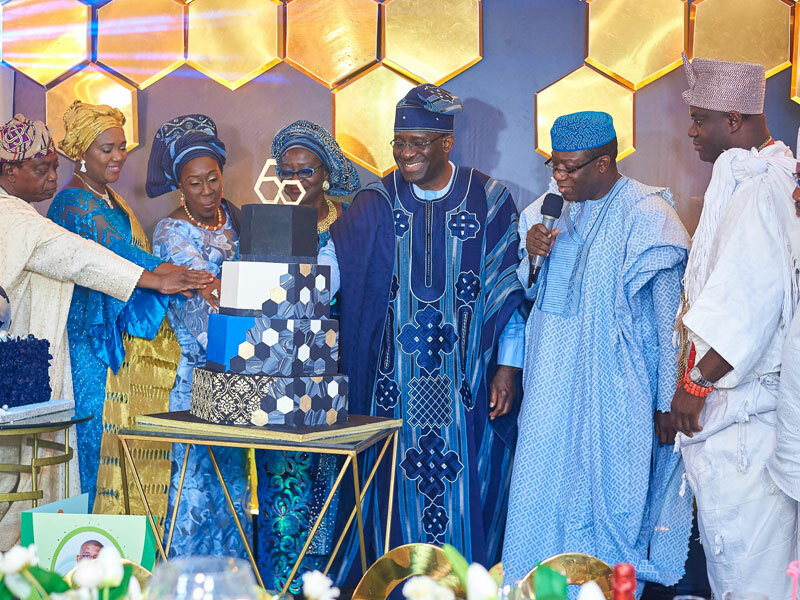 President of African Development Bank, Akinwunmi Adesina, in a congratulatory message, expressed delight while thanking God for Olagunju’s landmark of turning 60 years. Akinwunmi, who noted that God has been gracious to the celebrant, prayed that God may continue to grant him much joy, happiness, good health and length of days to fully enjoy the fruit of his labour. The Director General of the Nigerian Stock Exchange, Mr. Oscar Onyema said in particular the exchange commended Dr. Olagunju’s acting leadership of BoI in 2016/2017 period during which the bank simultaneously achieved up to 50 per cent increase in loan disbursements to the MSME Sector and a significant reduction in non-performing loans. He noted that this also culminated in the upgrade of BoI’s ratings by both domestic and international rating agencies under your watch. A former Director General of the National Broadcasting Commission and Koguna of Sokoto, Mallam Danladi Bako, described Olagunju as a beacon of hope, humility and generosity. “In a nation, where many people have little regard for values, Olagunju, through his exemplary character, has shown that the future is indeed bright for Nigeria. He is a hardworking gentleman, ever focused, humble and generous with all that God gives him in knowledge and resources. On this occasion, we can only wish him, his wife –Mobolaji and the chidren, the best of the moment,” Bako said. Governor Kayode Fayemi of Ekiti State; the Minister of Women’s Affairs who is also doubling as Minister of State for Industry Trade and Investment, Mrs. Aisha Abubakar; the Special Adviser to the President on Social investments, Mrs. Mariam Uwaise and the Ooni of Ife were amongst the gaily dressed dignitaries from all walks of life who converged on the Harbour Point in Lagos last Sunday to celebrate Olagunju. Also present were former Ministers of Industry, Chief Kola Jamodu and Mr. Olusegun Aganga; retired Inspector General of Police MD Abubakar, former Central Bank deputy governors, Mr. Ernest Ebi and Dr (Mrs) Sarah Alade, current and former bank MDs, industry captains, leading development scholars, family and friends as well as Dr. Olagunju’s former colleagues from both BoI at NTA. Olagunju, who retired recently after successful careers in broadcasting and banking, has a doctorate degree in Business Administration from the Paris School of Business in 2017; Bachelor of Arts Degree in History and Master of Social Science Degree in Mass Communications from the University of Lagos in 1981 and 1984, respectively. His career trajectory and accomplishments in journalism, banking and public service speak volume of his resilience, determination and penchant for capacity building. As a cub reporter at the Nigerian Television Authority, (NTA), in the early 80s, Waheed Olagunju, was quick to worm himself to the heart of his bosses and top government functionaries through the sophistication of stories that usually came from him. As a result of the quality of his financial/economic analysis and the depth of his report on the NTA, Olagunju was beckoned upon to come and work at the then Nigeria Industrial Development Bank (NIDB) in 1989 as communication personnel. Within few years of interacting with financial experts, reading economic journals and participating in local and international conferences and workshops, he became master of NIDB operations, which informed the decision to upgrade him as company secretary as well as head of corporate communications. As he retires from service after 28 years in the investment and development banking environment, Olagunju has promised to use his period of retirement to offer advisory services to government and players in the private sector across Africa.